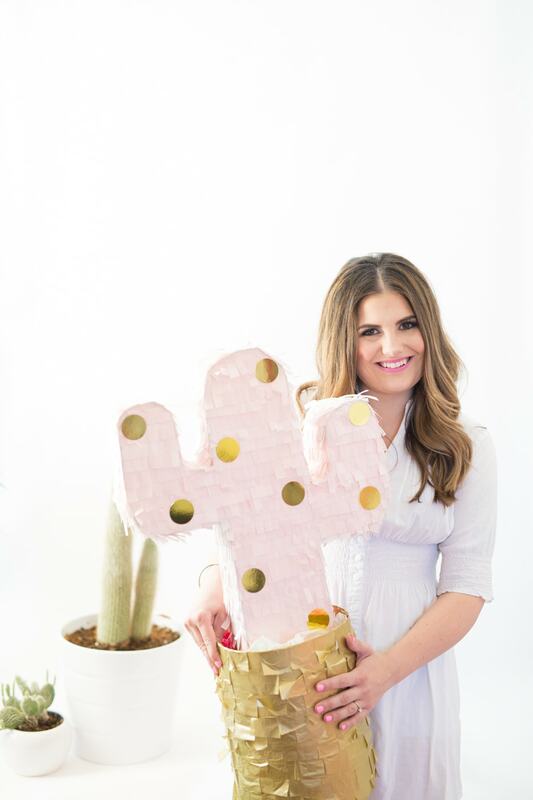 I always love a fun celebration, and what could be better than a cactus-themed party?! The whole cactus-theme is something that’s been on my radar for a while. I feel like they just sing summertime and make everything just SO much more fun! I mean, they don’t always have to be prickly plants that we all avoid. 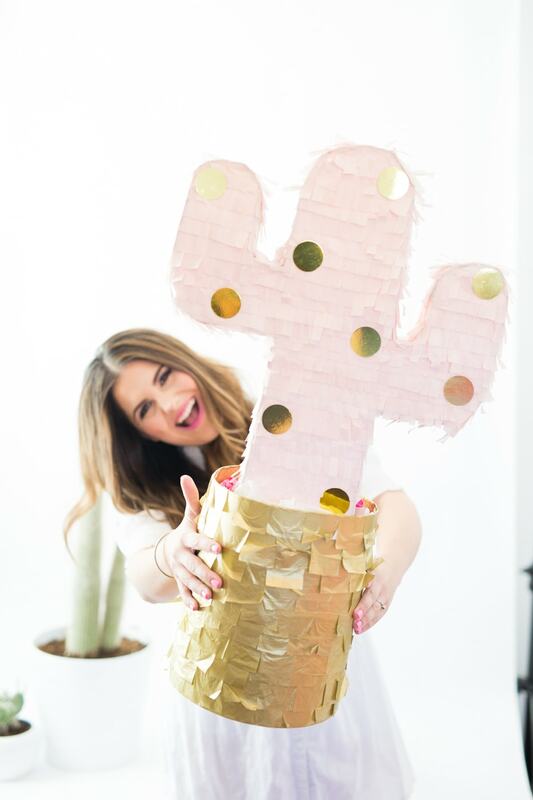 And I promise you won’t prick your finger on this DIY piñata. ;) It’s 100% pain-free, not to mention filled to the brim with the good stuff! Fringe and polka dots are some of my favorite trends in the party world! And one thing that I absolutely LOVE about piñatas is that you get to have control over what you fill it with. Especially if there are any known food allergies with guests, it can all easily be avoided and everybody wins! 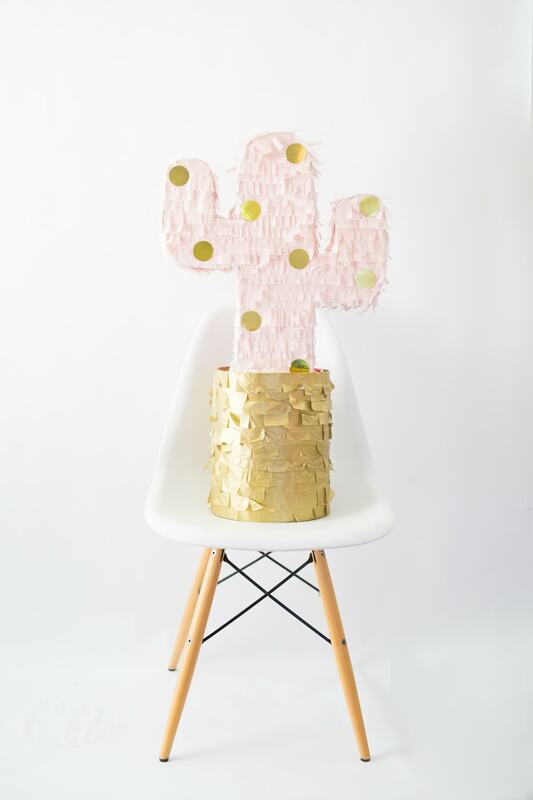 This DIY cactus piñata will be the highlight of your next party, for the kids and adults too! We all have to bring out the kid in us once in a while, right?! Draw a cactus shape onto half of the foam presentation board and cut it out. You can either freehand this or find a stencil online! Cut out the cactus. Trace the cactus cut-out onto another piece of foam board and cut that cactus out. Cut a candy hole on the back of one of the cactus cut-outs. Cut about 3-inch-wide strips of the flimsy presentation board and tape them along the edges of each cactus cut-out. The board will need to be bent along the curvy parts of the cactus arms. At the center point of one of the cactus cut-outs, cut holes, and tie a string for hanging. Tape the edges of the second piece of foam presentation board to connect the piñata and create a 3-D cactus! Create the base by taking the presentation board and rolling it until the edges meet, making a circle. Tape into place. Cut two circles out of the foam board or cardboard. This will be for the bottom of the vase, and as a topper to attach the cactus. 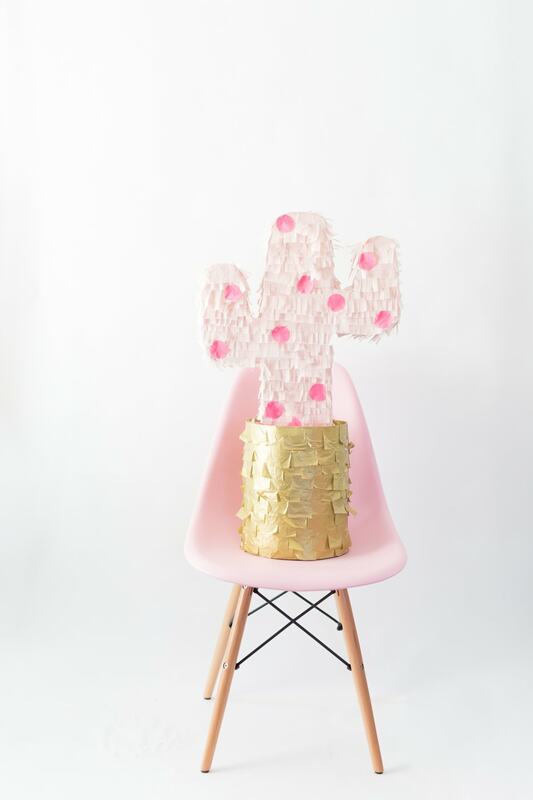 Hot glue circles into the round vase where you want the cactus to sit. Glue top and bottom of that board to make it sturdy. Hot glue your bottom circle into the vase. Cut out squares of gold tissue paper and glue onto the vase, starting from the bottom up. Cut 2-inch-thick strips of tissue paper and fringe the ends. Glue fringed tissue paper along the edges of the cactus first, then move to the front and back of the cactus. Hot glue the bottom of the cactus to the top of the vase. 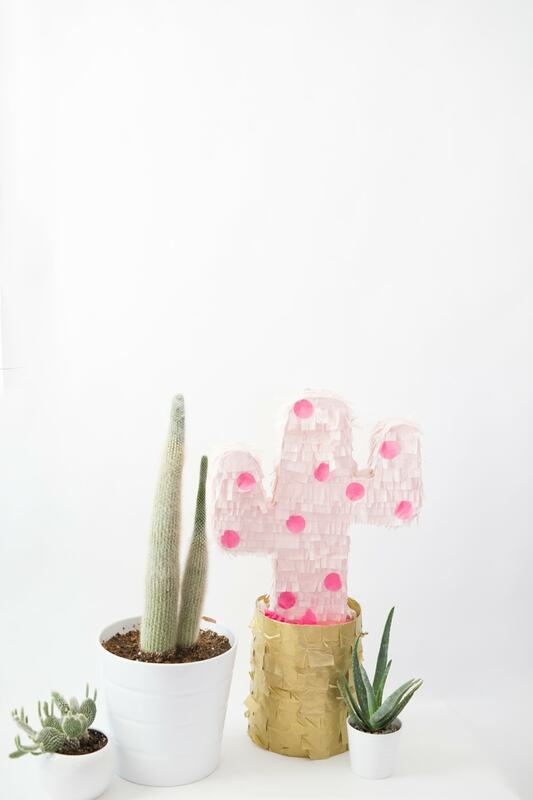 Crumple up tissue paper to cover the vase around the base of the cactus and hot glue it down. Cut out confetti dots and glue on in desired pattern. Hang up and take a whack after filling with candy! Photography for Best Friends For Frosting by Mikayla Christine Photography. Makeup by Taryn Passifione. Hair by Emily Scott.